John Mueller from Google talked about the issues that can arise when splitting one site into two or multiple sites. This is something that many site owners do, but depending on the reasons for doing it – whether SEO or for the user – you can end up doing more harm to your overall search visibility, even with the potential benefits. One of the issues is that unless it is clear that a searcher is looking specifically for the site in question, it is rare that Google will show more than two results from a single site (although a single result can have sitelinks) in a single search results page. So some SEOs think if they split a single site into multiple individual ones, it will help them “own the serps” for the particular keyword or keyword phrase. But the problem whenever a site is split, is that some of those ranking signals will be weakened when they are also split between sites. So those individual sites will not rank as well as the original if those signals are also split. John Mueller commented about this on Twitter when someone asked if there are risks of redirecting a single site into two different ones. 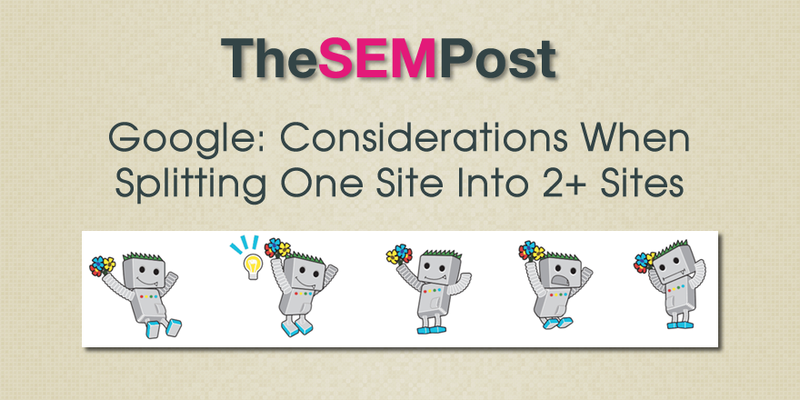 If you split a site into two sites, each site will have to rank on its own. That can result in the 2 sites not being as visible in search (or as much traffic) as the single old site (eg, very simplified: 2x page 2 probably gets fewer visits than 1x page 1). He also reminds people that whenever a site redirects to another page or site, there is a delay where Google is recrawling, matching old pages to new pages with the redirects and transfering signals to the new pages, if needed. He also confirms that sites that are being split or merged will take longer for Google to process than if it was a regular site move. It would probably be a bit confusing for our systems for a while, until things settle down and we understand the new sites better. In general, splitting or merging sites does take a lot longer to be processed compared to a normal site-move. This is normal behavior that many SEOs have confirmed. Google is pretty good at normal site moves where each page is redirected to the corresponding page on the new site, such as when a site is just changing to a new domain or switching to HTTPS. He also recently talked about dividing pages on the same site can also lead to dilution of ranking signals for those pages as well. Bottom line, think about the reasons why you are splitting the site into more than one. If it is for the user, great, just be aware of these SEO issues. But if it is for SEO purposes to own more of the search results, then think about the strategy and if the site can support the potential loss of traffic for some or all of the pages, if those signals are not strong enough to retain the rankings for any of the keywords when split.